Since the discovery of the first hydrothermal vents along the Galápagos Rift in 1977, scientists have puzzled over the origin of methane rising from these deep-sea hot springs. Regardless of differences in location, geology, and chemistry, all hydrothermal vents worldwide release at least some methane in varying amounts. Whether the gas comes from water-rock reactions during fluid circulation, or preexists as pockets of methane stored in the crust, remains a controversial question. A new study by DCO researchers finds striking similarities between methane from very diverse vents associated with relatively high amounts of methane, pointing to a common source in the crust. DCO members David Wang (formerly at Massachusetts Institute of Technology, USA), Eoghan Reeves (University of Bergen, Norway), Jill McDermott (Lehigh University, USA), Jeffrey Seewald (Woods Hole Oceanographic Institution, USA), and Shuhei Ono (Massachusetts Institute of Technology, USA) used a novel method to infer the temperature at which hydrothermal vent methane formed or was stored. Results from four diverse vent fields suggest that methane was produced above 270 degrees Celsius in all fluids, implying that it came from the crust, rather than forming in shallower and cooler environments, or during fluid circulation. The researchers report these findings in a new paper in the journal Geochimica et Cosmochimica Acta . 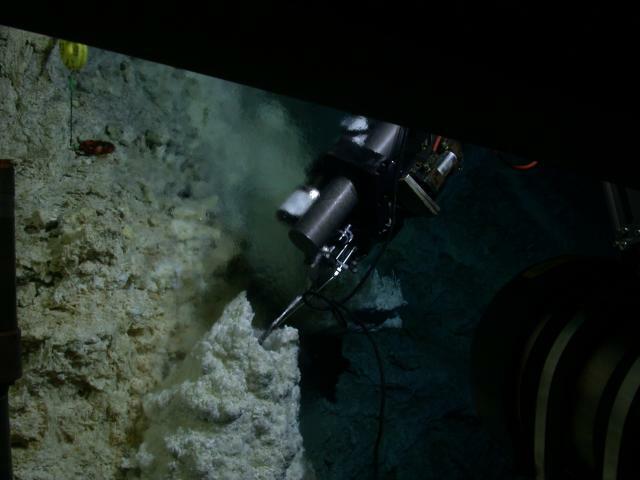 “Our study reveals the origin of methane in hydrothermal vent fluids and is one of the first to get a really good idea of the temperature at which it forms,” said Ono. The researchers estimated these temperatures by measuring methane isotopologues in their samples. Methane (CH4), has one carbon and four hydrogen atoms. Each atom can come in multiple forms called isotopes, meaning that the atom has a different number of neutrons in the nucleus, which slightly alters its mass. Most carbon has a mass of 12, but a small fraction has a mass of 13. Likewise, most hydrogen has a mass of 1, but atoms with a mass of 2, called deuterium, also exist. By combining those isotopes, methane can come in different “flavors” called isotopologues. Specifically, the researchers measured the most common flavor of methane (12CH4), methane carrying a single deuterium (CH3D) or a carbon-13 isotope (13CH4), and the even rarer “clumped” isotopologues that carry one of each (13CH3D). The isotopologue profile can reveal details of the methane’s source, and whether it formed from microbes or from abiotic reactions with no life-forms involved. Methane samples from four hydrothermal vent fields from very different locations, temperatures and fluid chemistries, all had surprisingly similar isotopologue profiles, indicating that the methane formed or was stored at around the same temperature, averaging 310 degrees Celsius. This temperature is too cool for the methane to have originated from deeper melted rocks, and too hot to come from microbes or serpentinization reactions, such as those typified by one notable site called “Lost City,” where vent temperature is much lower. “If you take methane from the Pacific or Atlantic, you see the same signal. It seems like there is a unified process making methane in these hydrothermal vent areas,” said Ono. He and his colleagues conclude that the methane comes from fluid or gas bubbles trapped in the ocean crust and that circulating hydrothermal vent fluids liberate this gas and bring it to the surface. Ono and his colleagues previously developed a next-generation laser infrared spectrometer to measure methane isotopologues. In its early stages, the spectrometer was funded as part of DCO’s instrumentation initiatives. It works on the principle that molecules absorb energy differently based on how the bonds between atoms bend and stretch as they move around. These absorption properties change depending on the masses of the atoms. Using tunable laser adsorption spectroscopy, Ono can measure the concentrations of rare isotopologues based on how a methane sample absorbs different wavelengths of light. Such an instrument, if miniaturized, could be sent to Mars, Enceladus, or other planetary body with whiffs of methane, to look for signs of life. The device could potentially detect if the gas has biological origins or not. Closer to home, Ono plans to use the next-generation infrared spectrometer to determine the origins of methane in deep ocean sediments and in chunks of methane-ice along the seafloor called gas hydrates. With this data, he can begin constructing a three-dimensional map of the distribution of methane within ocean crust, showing the locations and sources of different types of methane and how they vary with temperature and depth. “This study is a giant step toward that goal,” said Ono. At Von Damm hydrothermal field, at the Mid-Cayman Spreading Center, hydrothermal vent shrimp and gastropods climb a chimney structure that releases methane-rich, super-heated 115 degree Celsius fluids into seawater. Credit: NOAA Okeanos Explorer Program, Mid-Cayman Rise Expedition 2011.